Rana Daggubati today unveiled the motion poster of Ee Nagariniki Emaindi which is quite intriguing and introduces us to the characters in the film. 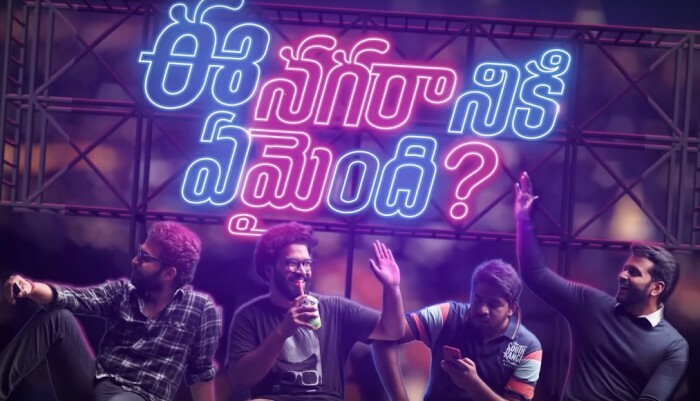 The cast of Ee Nagariniki Emaindi is filed with debutante but do have a background in short films in Telugu. The makers had held a private screening of Ee Nagariniki Emaindi for industry insiders a while ago and the film is said to have impressed mightily. The buzz in the Telugu film circles is that Ee Nagariniki Emaindi will be another path-breaking film in Tollywood this year and will set new levels of records. Made on a nominal budget, Ee Nagariniki Emaindi has music by Vivek Sagar who had rendered the tunes for Pellichoopulu too. The songs of Pellichoopulu are favourite to many Telugu film lovers and are till date crooned by many. And the music in the motion poster of Ee Nagariniki Emaindi too seems very impressive and sounds classy. Tharun Bhascker will look to continue the momentum he gained with Pellichoopulu and score a hit with his second directorial too. Interestingly, Tharun Bhascker was given an offer by eminent producer Suresh Daggubati on the night of the audio launch of Pellichoopulu and two years later the two are now collaborating for a film.